Even though I am dedicated carnivore, I just do not like pizza with any sort of meat product on it. It used to be that when I ordered pizza it had to be meat-eater special: bacon, ham, Italian sausage and of course solid layer of peperoni. If we wanted to eat pizza we had to go to pizza joint or order one. Well, how the times have changed! Now, the only pizza we eat is just what I bake: super thin crust (from a dough I made night before), the best tomato sauce (mine, of course made from my own grown-from-seeds tomatoes), mix of Italian cheeses that I grate (Provolone, Asiago, Parmigiano Regiano and Mozzarella). 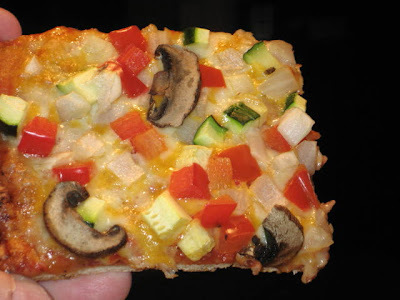 For toppings, it is just white or Vidalia onions, zucchini and red peppers chopped into 1/4” chunks and sliced cremini mushrooms, all in one thin layer. 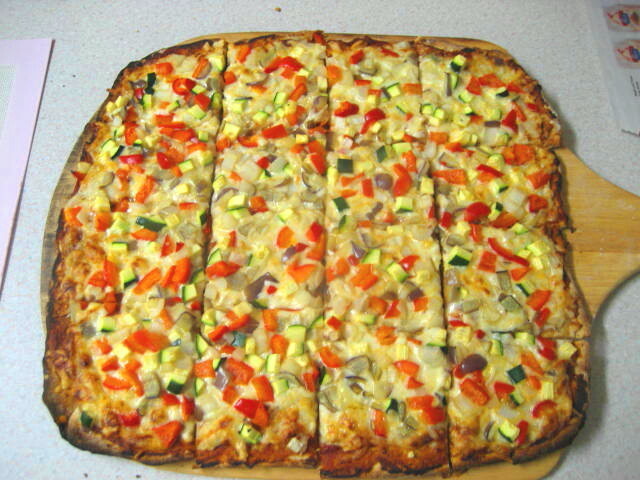 I like to see the cheese in between the vegetable toppings, only the mushroom slices are overlapping in second layer. Way back, I used to order Chicago style pizza from time to time but now I would have to be close to total starvation before I would touch this thing. Pizza? More like a casserole (just like Bobby Flay likes to say) or a stew on a wet bread. Here is my time proven recipe. This pizza is just as good when reheated in a toaster oven as it is when served fresh. 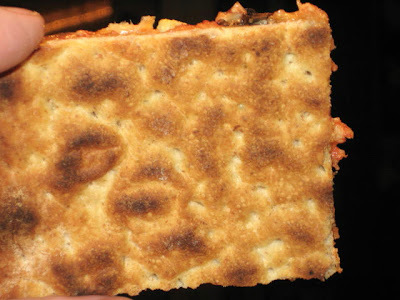 One very important note: don’t even bother to try to make thin crust pizza without pizza stone, it just will not work. Also, I always pre-bake my pizza and then dress it up, it makes the job of dressing the pizza so much easier and it gives the crust that a nice crunch! Also, make sure to dock the pizza dough with a docker or with a fork. Another trick I have learned over time is to use wire cooling rack to put pizza on after it is pre-baked, it helps to keep bottom of the pizza to stay dry. Actually, it takes much longer to describe the whole process than it is to actually do it, but here it goes. Pulse all the dry ingredients in food processor with steel blade attached. Turn the machine on and drizzle in olive oil through the feed tube and then slowly add 1/2 cup tepid distilled water. Keep the machine running for about 30 seconds and then start adding more water one teaspoon at the time until the dough is one smooth ball whirling around. When the dough clears the side of bowl, you are done. Remove the dough to floured board and shape into smooth ball. Place in bowl thinly coated with olive oil, cover with plastic film and place in warm, draft free place. Better yet, let the dough rest in cool place overnight. Preheat oven with pizza stone placed on bottom shelf to 500 °F, it will take about half an hour. Roll out and stretch the pizza dough on floured countertop until the dough is 1/4” thick. Let the dough rest while you prepare the toppings. Have a sauce, cheese and veggies ready next to cooling wire rack. When the oven is ready (and infrared thermometer reads 500 °F on pizza stone) slide your peal (that was generously floured first) under the pizza and carefully slide it on pizza stone. Make sure that pizza was docked before it goes into oven or you end up with supersized pita bread (see above) It happened to me first time I made it. Bake for only 3 minutes. Remove from oven and turn over onto cooling rack with baked side facing up. Now is time to dress it up. Sauce goes down first in thin layer, then cheese and finally veggies. Mushrooms, if using, go on last. Slide pizza back on the peel (you may want to sprinkle a bit of flour first) and back to the oven for 10 minutes. 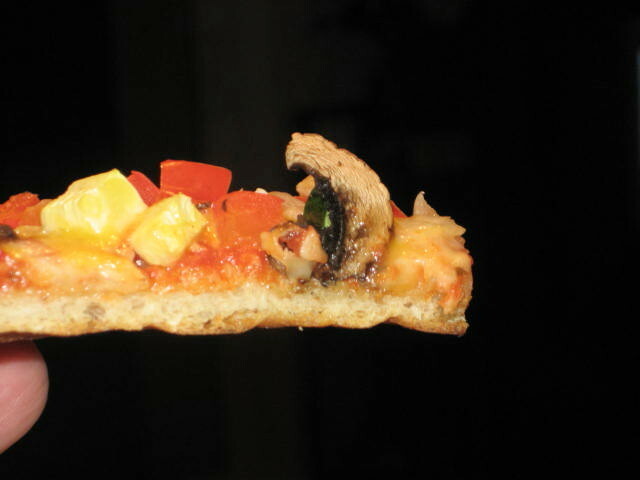 Remove pizza from oven, cut into pieces and slide it back on cooling rack, it will prevent pizza bottom from getting soggy. When you look at the bottom you will notice how beautifully the dough is baked: nice caramelized blisters all over the bottom of your pizza pie. Pizza is docked and ready for 3 minute pre-bake. In 10 minutes it will be ready! IT'S A SUPER MIKES ! The Marano brothers founded Mikes Pizzeria in the 70s. I delivered pizza for them back in 1996. They had the Super Mikes, described as "this huge rectangular pizza that could feed an army". It was delivered in a box twice the size of your NY veggie. I'd slip one in my trunk when my shift would end at 11pm and meet with the boy at the club :-) Boy were they glad. Yup, been there, done that. Except, my shift ended at 3:00 AM and I had to go to work at 7:00 AM. I was burned out in 1 month. No such thing as good old days for political refugees from behind the Iron Curtain country like me that refused any handouts or help from government. Chinese New Year of a Dragon is Coming!